If you know current or future students at Ohio University who will be attending classes in Fall 2010 and have a parent, grandparent, or great-grandparent who graduated from Ohio University, they are eligible for a $1,000 scholarship through the Ohio University Alumni Association. The deadline to apply is Monday, February 1, at 5 p.m. This might help you get through the next six weeks . . . The 35th annual St. Pat's in the Flats party has been confirmed for Saturday, March 13. 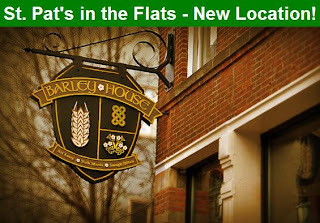 Note the new location: The Green and White Club has moved its annual shindig to an alumni-owned establishment, the Barley House on W. 6th. No RSVP needed, but you can expect to see a lot of familiar faces at this well-attended event. Festivities start at noon; $5 donation at the door. The Copeland Cares campaign is looking for the names and military addresses of Bobcats in uniform, as well as donations for care packages to be shipped in March. All Ohio University employees, students and alumni who are serving overseas in the military are eligible to receive an anonymous care package. Please contact Pam Boger by the end of February at boger@ohio.edu. Donations to help the effort are also being accepted. All checks should be made out to Copeland Cares and mailed to Copeland Hall.